Properties in Kyoto National Museum average 4.3 out of 5 stars. Property 9: Prime Location - Sweet Traditional Home Away From Home, Family friendly! Property 11: A charming cluster of 5 renovated trad modern houses, Max 30 ppl, "Uan/Hana"
Property 16: TSUBARA - a restored 90 year old Machiya -Elegant.Calm.Lovely- So close to Gion! 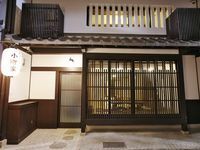 Property 24: Komachiya Kyoto traditional townhouse near Gion- with perfect location! Property 25: Downtown Kyoto Machiya - BEST LOCATION!! Property 29: Guest House10min to Kitano Tenmangu! Property 32: 3min to Station "Kiyomizu Vacation Stay"
Property 35: A guest house that renovates an old townhouse in Fushimi-Inari, Kyoto.One of all three rooms.Room for up to 2 people. Property 37: A guest house that renovates an old townhouse in Fushimi-Inari, Kyoto.One of all three rooms.Room for up to 4 people. A guest house that renovates an old townhouse in Fushimi-Inari, Kyoto.One of all three rooms.Room for up to 6 people. Property 40: A guest house that renovates an old townhouse in Fushimi-Inari, Kyoto.One of all three rooms.Room for up to 6 people. Property 42: Spacious&Clean. Near Kyoto sta. Loved staying in Machiya Momiji! Great experience to stay in a traditional Japanese home. The 5 of us were so comfortable. Perfect amenities, and a very comfortable bed :) Naoko was an amazing host, helped us everyday with some query of ours or the other. The ease of our stay was highlighted with knowing that Naoko was just a text away if we needed any help. Thank You so much for making our stay so comfortable! We spent a very pleasant 3 days in this traditional Japanese home on a lovely walking / market street just north of Gion. The house is very functional and has everything you need. And it&rsquo;s walking distance to several temples, neighborhoods, the market, etc.